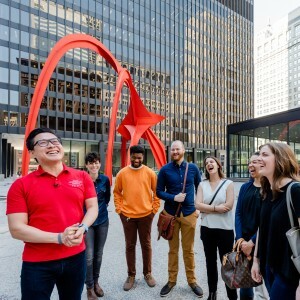 As a Chicago Architecture Center member, you'll enjoy a year of special events, inspiring programs, exciting tours, special members-only events and FREE unlimited entry to the city’s newest cultural destination. Support from Chicago Architecture Center members also funds initiatives that support our mission: inspiring people to discover why design matters. Start enjoying your membership benefits today! Call 312.922.8687 with questions. Don't miss out on these great benefits! These standard benefits apply to all levels. Special parking discount (4 hours for $15) at the LAZ garage, 111 E. Wacker Dr.
*Seniors (age 65+), students (with valid ID) and educators (with valid ID) are eligible for a 15% discount for an Individual, Dual or Friends and Family membership by calling our call center at 312.922.8687 or visiting our box office in person. ** On Saturdays, the River Cruise member benefit can be used for 9am, 9:30am, 12pm and 12:30pm departures through Oct. 6. Starting Oct. 13, the 12pm departure will be the only Saturday departure eligible for the member benefit.